Available for rent, is our recently renovated and extremely well maintained family cottage. This incredible water view location has an unobstructed view of the Atlantic and quick access to multiple beaches. The charming quiet neighborhood allows you to stroll or bike down the cottage road and take advantage of the large lawns, landscaping and multiple beaches. Within bicycling distance, however are the restaurants, shopping, and activities found in either Biddeford Pool or Kennebunkport. 15 minutes away is the Fun Town amusement park, and shopping outlets in Kittery and Freeport are both about 1 hour away. The primary living space of the cottage is on the second story allowing you to take advantage of the great views of the ocean. All bedrooms have just been renovated with new Maine Cottage style furniture. The cottage contains all of the comforts of home so that you can enjoy your stay. Even wired and wireless Internet. Come fall in love with our very special place. - Beds in both bedrooms upgraded from full to queen with new Maine Cottage style furniture. - Westin Heavenly mattresses purchased for all beds. - New teak and brass patio set, chaise lounges and cushions. - Lots of behind the scenes infrastructure upgrades to continue to maintain the cottage to a high standard. - Newly renovated bathroom using top of the line materials. toilet, shower, Bathroom renovated in 2012 to resort standards. New Pottery Barn Hotel linens provided for all beds. Resort quality towels provided for all guests. Stereo provided for upstairs, outdoor speakers available for deck. A current selection of magazines is normally available: Down East, Yachting, Skiing, Martha Stewart Living, Town & Country, etc. A changing assortment of board games and puzzles is normally available. The property features lots of grassy and landscaped areas that we seek to maintain to the highest standard. No canoe or kayak is provided, however the cottage is in an excellent spot to explore the Rachel Carson Wildlife Preserve that surrounds the property. Excellent kayaking and bird-watching area. The cottage features a 2nd story deck with 2 chaise lounges, table/chairs and the gas grill. The lower brick patio is surrounded by beach roses and features LL Bean rocking chairs and a hammock. This is a 5 star vacation rental, but I gave it 4 stars because the screen doors were damaged. My wife and I loved the house and the ocean view. It was a very relaxing vacation and we didn't feel compelled to get out and see things. That said, the area is beautiful and it is worthwhile to visit Biddeford Pool, Cape Porpoise, and Dock Square in Kennebunkport. Our only complaint is that the screen doors to the deck were torn. This was inconvenient because the door had to be open to enjoy the ocean breezes and unfortunately several flies liked to visit us. I spoke to Jeremy and he said he would repair them for next season. This is definitely a 5 star rental when the screens are replaced. Beautifully maintained and well-outfitted house right across the street from the ocean. Beautifully maintained and well-outfitted house right across the street from the ocean. Located near end of quiet, scarcely-traveled road. This is quite a magical home. It's designed to perfection and the setting outside is more than we hoped for. We are a family of sailors and it almost felt like being on a boat. We enjoyed many nights in town or buying our own lobsters and clams 6 minutes away. We could not recommend this home higher. This ocean cottage has everything you need for a wonderful vacation! Very comfortable! This was our second year here and can’t wait to return. We love the roses and wild flowers that line the path to the beach and river. We have kayaks and there is a boat launch at the end of the road. There is a beautiful nature walk through the woods to the rocky shore . 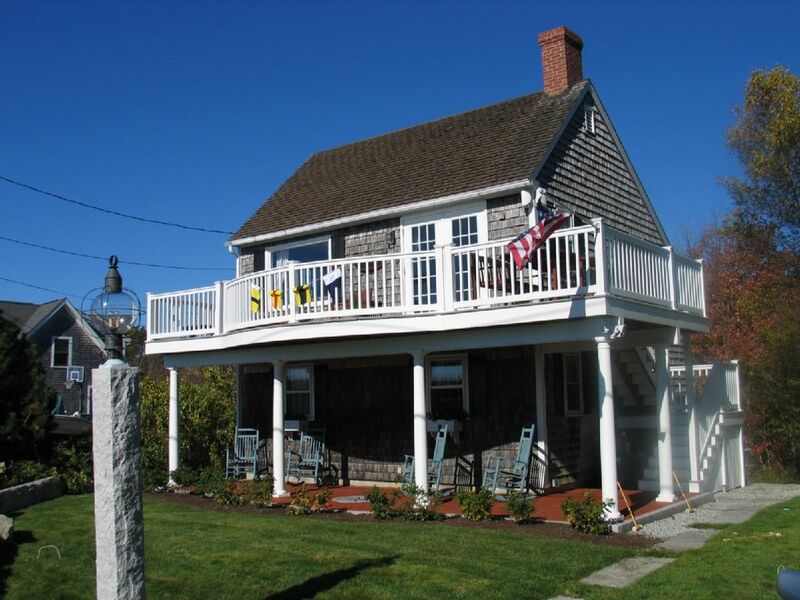 Wonderfully magical cottage with everything you need to fully enjoy this ocean retreat! This is a very special property with an amazing view of a gorgeous, quiet cove dotted with lobster buoys along the Maine coast. There are several small coves with beaches nearby within walking distance, as well as wooded trails for exploring. A longer beach is just a short drive or paddle away. The owner has thought of and provided everything you might possibly need to fully enjoy your stay, and is very responsive to guests--in fact goes above and beyond--to ensure your full enjoyment. The cottage is aptly named "dream cottage." We spent Christmas week at the property and enjoyed it immensely. Although the temps dipped below zero outside, we were toasty inside. Great heating system and wood burning stove. Beautifully updated bath and kitchen with granite tops and stainless steel appliances. What a wonderful place to unwind. The cottage is quietly nestled down a cottage lane between Biddeford Pool and Kennebunkport. Restaurants, shopping and numerous activities are a nice bike ride away. Kennebunkport Village is 10 minutes by car. 3 amusement parks are within 15-20 minutes. In addition, fishing charters, whale watches, bike rentals, windsurfing rentals are all nearby. Outlet Shopping in either Kittery or Freeport is 45 minutes away. Shopping at the Maine Mall is also 30 minutes away. Prices include all fees except for the 8% Maine rental tax. Unless otherwise stated check-in time is 2PM. Check-out time is 10AM.